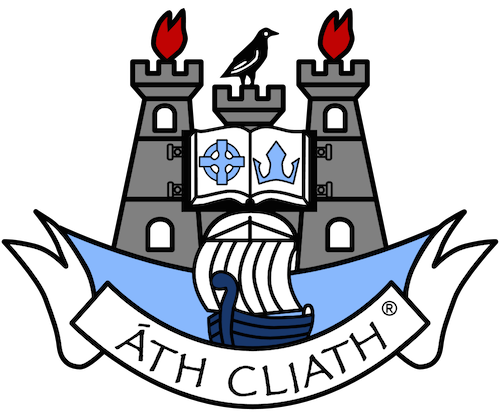 This crest is a version of the Dublin coat of arms, which has been the emblem of the city of Dublin for 400 years. The origin of the Coat of Arms is unknown, but there are numerous theories. The castles are watch towers outside the city walls. The castles are not castles at all, but represent 3 gates into the ancient Viking (Danish) city. 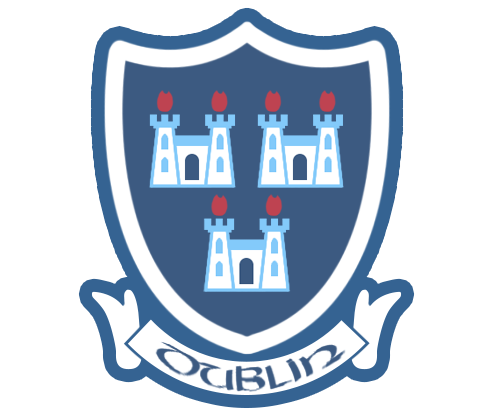 In 2004 the Dublin County Board decided to design a new crest that would be unique to Dublin GAA. The new crest envisions Dublin’s historical past: the castle in flames signifies the city of Dublin and pays homage to the Dublin Coat of Arms, the Raven signifies the county of Fingal, the book (St. Tamlacht (Tallaght) manuscript) signifies the county of South Dublin and the Viking longboat signifies the county of Dún Laoghaire-Rathdown. 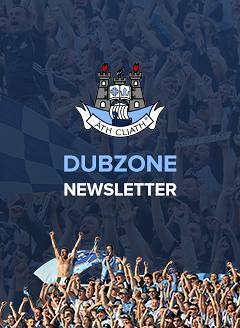 The last touch is ‘Dublin’ being replaced by it’s Irish equivalent ‘Áth Cliath’.